Caption slip reads: "Photographer: Miller. Date: 1957-07-14. Reporter: Donoghue. Assignment: International Outdoor Art Festival. 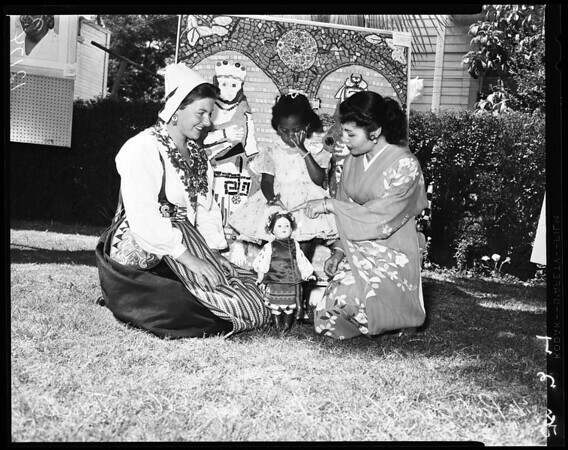 23/24: Queen for a lifetime: baby Lyn Ellis, 3 1/2, adopted daughter of Mr. and Mrs. William R. Ellis, receives attention from Patricia Thomas (left) 22, and Tomiko Sato, 26, two officials of the International Outdoor Art Festival, sponsored by Baby, auxiliary of the Los Angeles County Bureau of Adoptions, to call attention to need of adoptive homes for for [sic] minority group children."